Snecma believes the new Silvercrest engine will have half of the noise footprint of slightly smaller engines, such as the General Electric CF34-3 and Rolls-Royce AE3007C2. Snecma appears to be giving itself more time before beginning flight-testing of its first business jet engine: the Silvercrest. But the apparent delay in what had been projected at last year’s EBACE show as a first flight in the first half of 2013 will likely have little bearing on the certification path for the new turbofan’s first applications. The 9,500- to 12,000-pound engine has already been selected to power Cessna’s new Citation Longitude, due to enter service in 2017. French airframer Dassault is set launch its new SMS aircraft this fall at the NBAA show in the U.S. and there appears little to contradict informed conjecture that the Silvercrest will be its chosen powerplant, too. If Snecma stays on track with its goal of certifying the Silvercrest in 2015 (first by EASA, followed soon after by the FAA), this should be consistent with Dassault’s plans for the SMS to enter service in 2016. After initial appearances at last year's NBAA convention in Orlando and last November’s Middle East Business Aviation exhibition in Dubai, a Silvercrest engine mockup is expected to make its European debut here at EBACE. Flight trials are set to take place with a Silvercrest attached to the right-hand pylon of the GII testbed, in place of the usual Rolls-Royce Spey powerplant after completion of the pylon modifications and the addition of telemetry equipment. This process was expected to take about 18 months and could be a reason for the apparent further delay. Apart from the powerplant destined for airborne flight trials, Snecma is building eight development engines for testing andcertification. It says the Silvercrest is a “true on-condition engine” that will have no fixed inspection interval for maintenance, and will use in-flight engine-performance monitoring. The Silvercrest program provides a good illustration of how different Safran companies and joint venture members can contribute to the group’s output. Safran Electronics will provide full-authority digital engine controls. The low-pressure (LP) compressor, forward sump and lubrication unit come from Belgium’s Techspace Aero (the former FN Moteurs), which is a 55.8-percent-owned Safran subsidiary producing components, modules, subassemblies and test stands for aircraft and rocket engines. It also is part of a technological development program with GE Aviation for new-generation engines, including the TechX business jet powerplant. The Techspace Aero LP compressor draws on work done in the European Vital low-noise/-emission research project, for which it provided an LP compressor with improved aerodynamics. By the end of last year, Techspace Aero had delivered five complete LP module assemblies. Furthermore, the centrifugal stage of the Silvercrest engine’s core demonstrator tested more than five years ago was designed by Turbomeca. According to Loic Nicolas, Snecma’s business aviation general manager, service for the Silvercrest engine will be provided by new service centers in the U.S., Asia and France (covering Europe and the Middle East). 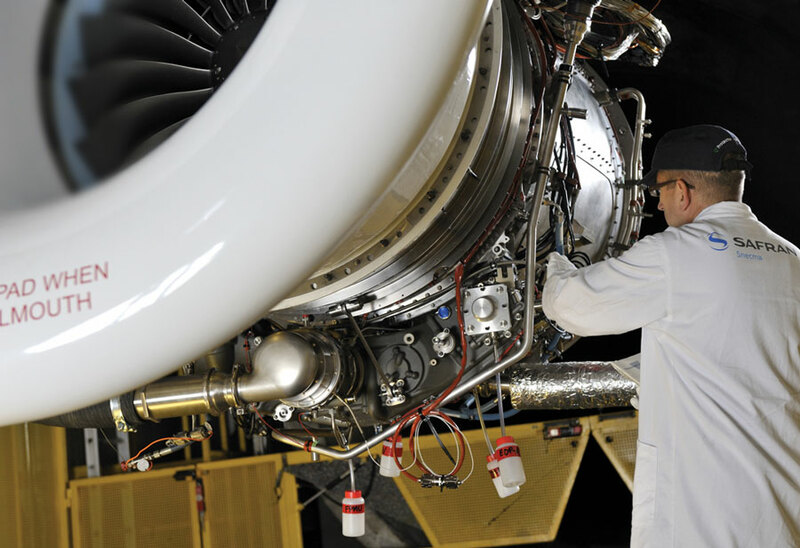 Snecma is using sophisticated performance monitoring systems on the new engine that allow data to be downlinked to ground centers for computer analysis.